If you’ve been shopping around for a new SUV, we’re sure you’ve landed on the 2019 GMC Acadia. After all, the vehicle provides all of the advantages that a customer could possibly want as they’re shopping for a new ride. Instead of boring you with all of the details of the SUV, we decided to spice it up a bit. Instead, we explored some of the most impressive numbers and specs that are included in the 2019 GMC Acadia. By highlighting some of these individual features, we can better emphasize that the nameplate is the perfect option for you. Who doesn’t want some power from their brand-new SUV? Well, drivers can expect optimal performance when they opt for the available 3.6-liter six-cylinder engine in their brand-new 2019 GMC Acadia. The system manages to deliver impressive performance specs at 310 horsepower and 271 pound-feet of torque, meaning owners will be more than prepared for their upcoming journey. This power also plays a major role in the 4,000-pound towing capacity, a factor that makes the 2019 GMC Acadia one of the most versatile vehicles on the road. Of course, that’s not your only engine option as you are shopping for or building a 2019 GMC Acadia. Rather, the SUV can alternatively be equipped with the 2.5-liter DOHC four-cylinder SIDI engine, which cranks out an impressive 193 horsepower and 188 pound-feet of torque. While it should be obvious, these are more-than-adequate numbers for an SUV. Even more impressive is the fuel efficiency numbers. Thanks to fuel-savings technologies like the Stop/Start function and Variable Valve Timing, drivers can expect their SUV to deliver an incredible 26 mpg highway fuel efficiency. Those are numbers that are rarely seen in this segment, and it’s one of the major reasons why the 2019 GMC Acadia should be atop your list. The brand added a number of additional functions that will ultimately impact the performance and drivability of your new ride. The Traction Select System allows you to choose between five different driving scenarios (All-Wheel Drive, Off-Road, Snow, Sport, Trailer/Tow) to maximize both performance and safety. Meanwhile, the Continuously Variable Rear-Time Damping system assures that you’ll always have an optimal handle of your brand-new ride. This 2019 GMC SUV’s impressive eight-inch-diagonal GMC Infotainment System certainly has a spot on the top of the list. The intuitive technology makes it incredibly easy to access your preferred application, whether it be radio or navigation. Plus, thanks to the inclusion of the Apple CarPlay and Android Auto compatibility, drivers can easily stay on the grid whenever they’re on the road. These technologies allow drivers to access many of their phone’s most basic functions, including phone calls and texts. The other technological functions included in the SUV generally impact convenience and safety. For instance, the Rear Seat Reminder will alert the driver whenever they’ve left something out back, whether it be a bag of groceries or (God forbid) a child. Finally, the Driver Information Center is cleverly placed right in front of the driver, providing them with essential information throughout their journey. While you had to squint to see this information in a vehicle previously, it’s now displayed in high-resolution, making it incredibly easy to monitor your fuel efficiency, your speed, or important vehicle information. Regardless of which paint offering you end up opting for, we’re very confident that you’ll be happy with your decision. The color choices don’t end there! Customers will also have the ability to choose from a pair of interior color offerings: Jet Black and Cocoa Light/Ash Gray. Both of these schemes deliver plenty of elegance to the interior of your SUV, so you can’t go wrong with either option. Okay, we’re cheating a bit with this particular number. However, we couldn’t write about the 2019 GMC Acadia and not discuss the nameplate’s incredible safety functions. These features aren’t only intended to protect in the event of an accident. Rather, they’ll also play a role in preventing those accidents from occurring altogether. Inclusions like the Lane Change Alert provides the driver with an extra set of eyes, as the technology (along with the accompanying Side Blind Zone Alert) will alert the driver if another vehicle has snuck up beside the SUV. A number of similar functions will prove to be invaluable on the highway, as they should reduce the chances of a devastating collision. There are also functions that will reduce the chance of a fender bender in a parking lot. The Rear Cross Traffic Alert will notify the driver if another vehicle is about to cross behind their SUV, and they can visualize and monitor the situation via the Rear Vision Camera System. There’s even a Rear Park Assist, with this feature helping to guide drivers into a tight, difficult parking spot. Perhaps the most notable safety function is the Teen Driver Technology, which is intended to promote safe driving habits in younger drivers. When teenagers take the wheel of the 2019 GMC Acadia, the vehicle will automatically activate all of the advanced safety functions. The vehicle will also refuse to operate some basic functions (like radio audio) until occupants are traveling in the safest possible conditions. When these teen drivers have completed their journey, parents can monitor their trip and their driving habit via the in-vehicle report card. GMC isn’t necessarily known for their safety functions, but there’s no doubt that this attribute was a priority in the 2019 GMC Acadia. If you’re opting for a new SUV, we’re sure you were expecting the vehicle to deliver a number of storage amenities. Well, the 2019 GMC Acadia does not disappoint, as drivers can easily fit any cargo inside of the vehicle for their upcoming journey. Owners can easily fold and hide the second- and third-row seats and they’ll end up unlocking an incredible 79-cubic-feet of maximum cargo space. Whether you need to fit sports equipment, school projects, or both, you’ll have more than enough room to fit this luggage inside of your new SUV. The nameplate also provides drivers with even more places to store their cargo. The center console storage spot is a great place to hide your valuable gadgets, while the second-row rear storage drawer can help you store any essential vehicle tools. There’s even a covered under-floor cargo-area storage area, providing even more space for loading that cargo. 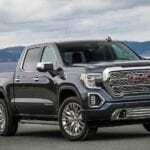 Previous post: Is There Really a Difference Between The 2019 GMC Sierra 1500 and The 2019 Chevy Silverado 1500?